The 2007 season was marked by the acquisition of Borasbot (and the depletion of the farm system). The trade was supposed to put the Braves over the top but they were doomed by a porous rotation beyond Huddy and Smoltz. Fellow 20 worsters Kyle Davies, Jo-Jo Reyes and Mark Redman received a significant number of starts. Buddy Carlyle started 20 games. Chuck James, 30. 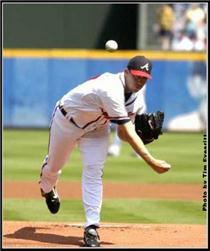 Lance Cormier, who walked 39 and allowed 90 hits in 2006, re-entered the rotation in June and was consistently awful. He had a 6.85 ERA in 9 starts, walking 4.3 and allowing 11 hits per 9 IP — and these were starts made during a pennant race that wasn’t. Cormier as a Brave: 6-11-5.73, 119.1 IP, 146 H, 61BB, 24 HR, 1.735 WHIP. Lance Alworth is still cool. Lance Rentzel, not so much. Kelly Johnson just signed with Tampa. This will be the third team to feature Johnson and Escobar at 2B and SS. I wonder if that’s a first in MLB history to have the same pairing on three teams. And they did it in four seasons. Weird.